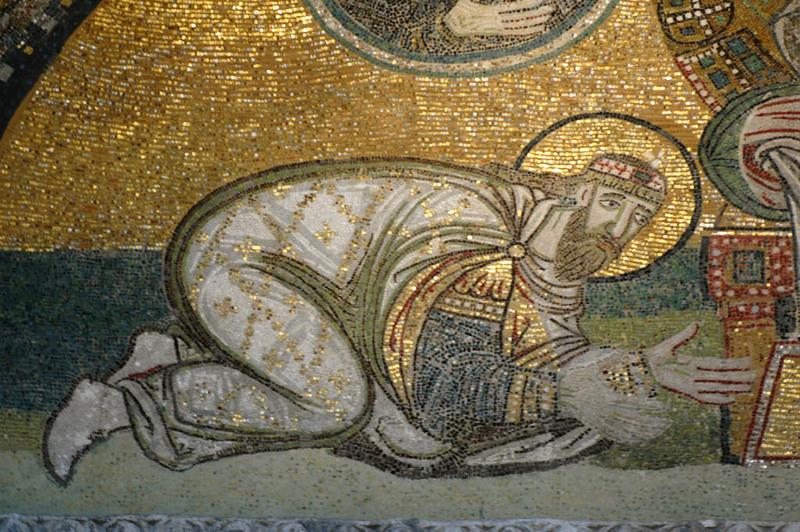 How did Byzantine fashion change over time? 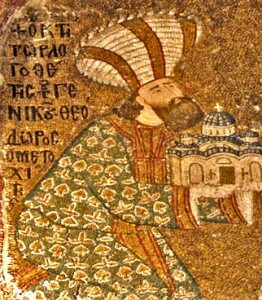 Ryan asks how Byzantine fashion changed over time. 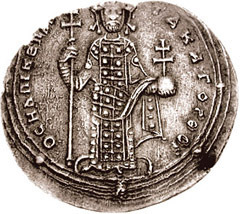 In the first few centuries after Constantine, the Byzantines held true to their roots, dressing in the standard Roman toga. But by the time of Justinian that venerable cloth was reduced to ceremonial occasions. 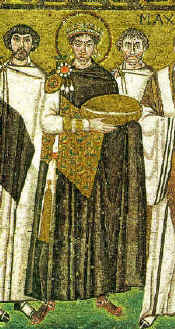 Most Byzantines preferred more simple, flowing clothes like the tunic that the ancient Romans had worn under their togas. For the poor, this held true for virtually the entire span of the empire. The toga did survive, but in heavily modified form. The imperial loros was an ornamental, stylized version that would be worn around the neck of an emperor and folded over his arm. 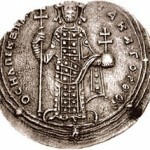 Here Romanus III is shown wearing it in the 11th century. While not attending to state functions, emperors tended to dress in ‘simple’ tunics. 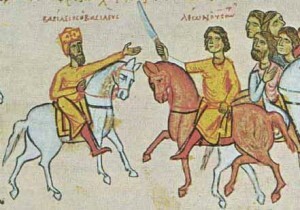 Here Basil the Macedonian meets his son Leo VI on the fateful hunting trip that would result in the former’s death. Throughout their history, the Byzantines tended to be more conservative with hemlines than their ancestors. They wore layers of clothes, sleeves went to wrists, and garments usually went to the ankles. Even the poor, who couldn’t afford (or want to get tangled in) robes that reached the floor, would wear leggings under their tunics. 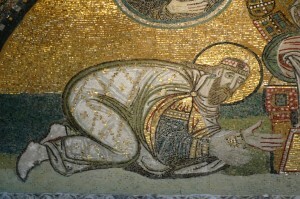 But in other ways, the Byzantines were much more expressive. Where the Romans had preferred simple white robes, the Byzantines were fascinated by patterns and incorporated them into virtually all their clothing. Utilizing a special form of silk called ‘samite’ or occasionally gold fibers, they embroidered tunics, dalmaticas, and even leggings and boots. Trade with the East brought in exotic colors and ornamentation- along with new styles to add to the mix. The nobility in particular got increasingly flamboyant toward the end- here is a 14th century merchant named Theodore Metochites proudly displaying the cutting edge of fashionable head wear. 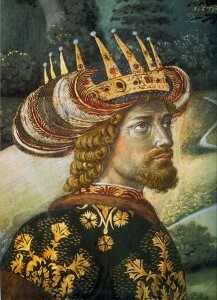 A century later the emperor John VIII brought the then current version on his tour of early Renaissance Italy. 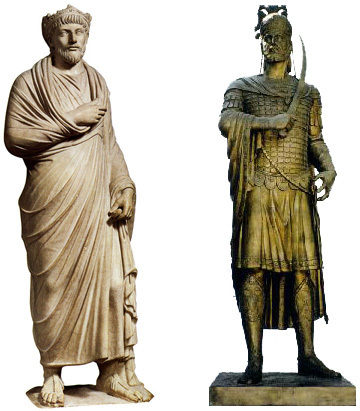 This was not what Western Europe expected Roman Emperors to look like, and such exotic dress made it that much easier to believe that they were never Roman to begin with. A mere hundred years after the imperial visit a German historian coined the term ‘Byzantine’ to highlight their ‘non-Romaness’. 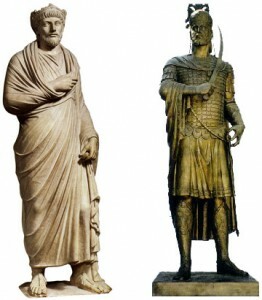 With that- as far as many westerners were concerned- the Eastern Romans were effectively cut out of history.